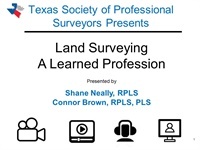 Shane received his AAS Degree in Surveying in 1992 from Tyler Junior College and in 2000 obtained license as a Registered Professional Land Surveyor. Shane is Partner and Vice-President of Stanger Surveying Tyler LLC and has 28 years’ experience in surveying with 26 of those at Stanger, performing boundary, topographic, route surveying and oil and gas surveying. 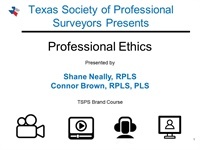 Shane developed and presented the “Becoming an SIT” seminar at the first TSPS spring Symposium and has co-presented both the TSPS brand “Professional Ethics” and “Land Surveying – A Learned Profession” courses for TSPS Chapter No. 4 and TSPS Symposiums. Shane is an active member of TSPS, both on the Chapter and State level, having served as TSPS President in 2014 and has served as Chairman of the Chapter Activities Committee, and as Chapter 4 President and current Chapter 4 Secretary-Treasurer. 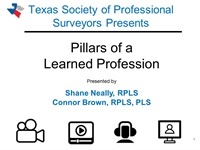 Shane is also the Chairman of the Texas Surveying Foundation, Inc. Shane was awarded the Chapter President of the Year award in 2004 and the Young Surveyor of the Year award in 2010.